Health Emergency and Disaster Nursing (HEDN) is the first contributes to disaster prevention and regeneration by bringing the wisdom of nursing science together. 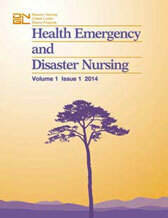 It is also the official English-language Journal of the Disaster Nursing Global Leader Program (DNGL). "Influenza Epidemics, Past and Present"
In 2019, we are seeking papers on the 1918-1919 influenza pandemic, particularly from a global perspective in towns around world. Reports about the current situation of influenza are also welcome. Papers should conform to journal guidelines. The 1918-1919 influenza pandemic killed millions of people around the world. Millions of others were seriously ill and many survivors suffered from post-flu complications. For our next issue of HEDN we are seeking papers that address the 1918-1919 flu from a global perspective, addressing how rural and urban communities, military organizations, and others responded to the pandemic. These might include public health educational campaigns, the use of volunteers, responses in Base Hospitals or on military ships, or papers on the effects of government policies, race, class or gender on the response. Papers on other influenza epidemics since 1918 will also be considered as well as papers on disaster preparedness for flu today. Health Emergency and Disaster Nursing (HEDN) expresses our deep sympathy for all people affected by the devastating 7.5 magnitude earthquake and subsequent tsunami on the island of Sulawesi, Indonesia. Health Emergency and Disaster Nursing (HEDN) expresses our deep sympathy for all people affected by the Osaka earthquake occurred on June 18, 2018. We extend our deepest condolences to the bereaved families of victims. We express our respect and gratitude to all parties devoting their utmost to rescue efforts and disaster countermeasures in the disaster zone, and we fervently hope that everyone in the disaster zone can recover as soon as possible and return to normal life. HEDN provides information nurses should know if they are considering responding to any disaster. All the articles are free to view. 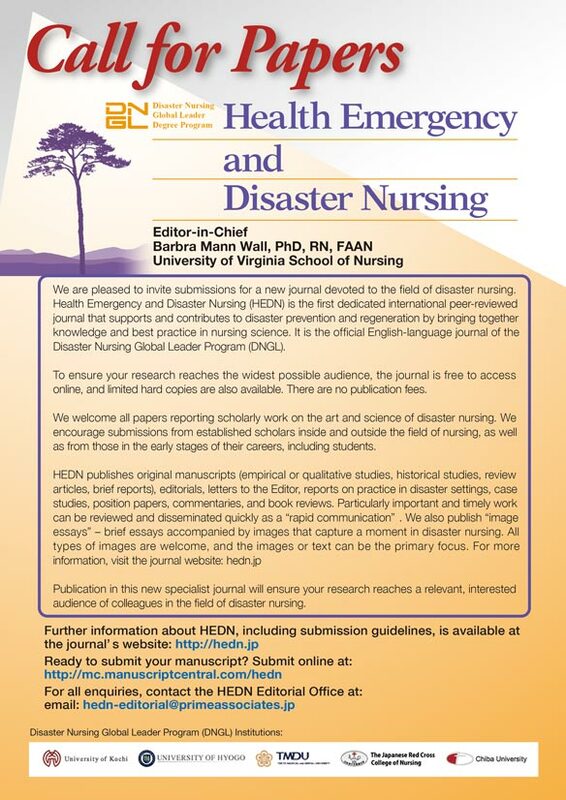 HEDN invites disaster nursing-related researchers, practitioners, and students to offer their opinions, tips, and messages to disseminate as new information through the HEDN journal, web site, or Facebook. When considered necessary, Japanese materials will be translated into English at the expenses of HEDN. Please contact HEDN-editorial@primeassociates.jp to share your thoughts and ideas.